Like I mentioned on Friday, I have been in a major food rut. Nothing has sounded good. Luckily, I had a new issue of cooking light to help me get out of this debaucle. 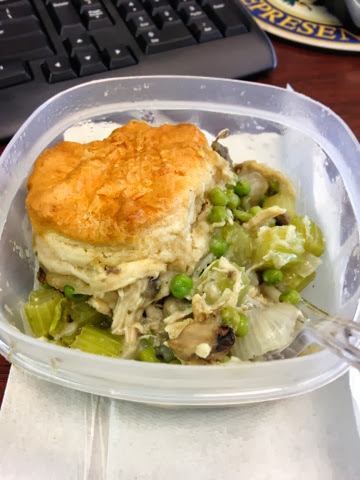 In the magazine there was a recipe for Healthier Chicken Pot Pie. 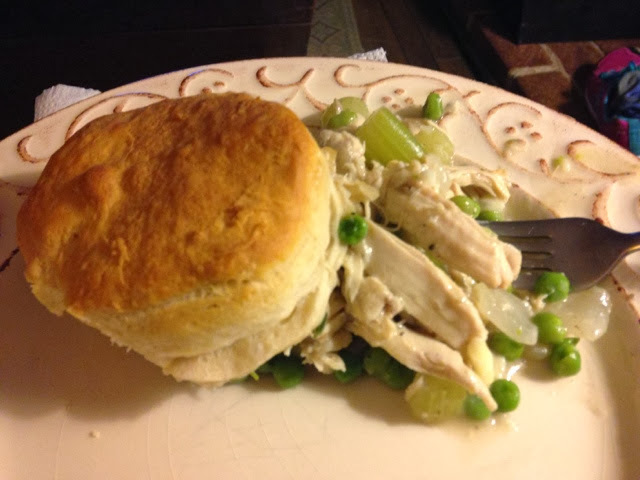 I opted to make the recipe easy peasy by utilizing canned biscuits. It turned out so well and was packed with veggies and lots of chicken. Try it out next time you need a fast and healthy dinner. Josh and I accidentally forgot the carrots at the grocery store. Still yummy but carrots add a lil somethin' somethin'. 1. Preheat Oven To Temperature on Canned Biscuit instructions (ours was 350 degrees). 2. In a large pot, add olive oil and chopped celery, mushrooms, onion, and carrots. Saute for about 5 minutes on medium heat. 3. Add garlic and saute for about another minute. 4. Add in flour and stir for another minute. Make sure to coat all of the veggies. 5. Stir in stock and brink to a boil. 6. Reduce to a simmer for about 8 minutes and add in chicken and peas. 7. Keep simmering until liquid is mostly absorbed and add thyme, sage and salt and pepper to taste. 8. 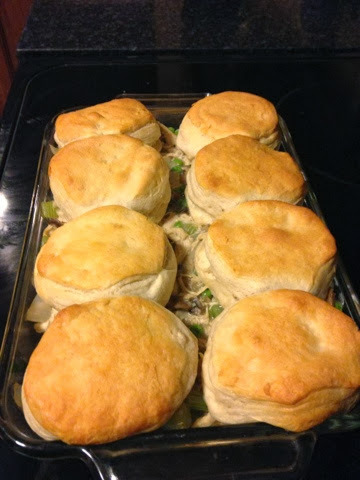 Pour chicken and veggie mixture into a large baking dish and top with biscuits. 9. Bake for roughly 20 minutes or until biscuits are fulled baked and golden brown. This was a fantastic dish and super easy. Try it out! It also heats up well for lunch the next day.